I always like to keep a record of what’s flowering in the garden over this Christmas and New Year period and there is no shortage of suspects this time round, with the weather being so mild. There’s even a solitary daffodil valiantly trying to flower! I was given the beautiful caterpillar vase pictured above for Christmas and it makes a superb showcase for these unseasonal blooms: hellebores, daphne, viburnum, heather, primroses and even a daisy (Anthemis)! Brilliant blue pansies and cyclamen are putting on a great display in my outdoor pots, and the ornamental quince, Chaenomeles Crimson and Gold, is covered in plump, red buds. I only hope that when the bad weather arrives, as it surely must, these blooms aren’t damaged, but go into suspended animation to continue at a more appropriate time…. Today, gloom and drizzle notwithstanding, I managed to escape into the garden for a spot of fresh air and recuperative snipping, cutting back the tired and drooping foliage of some of last year’s perennials: the scruffy stems of helenium, anemones, centranthus, geraniums, peonies and some asters and chrysanthemums were adding nothing to the garden scene and had to go. 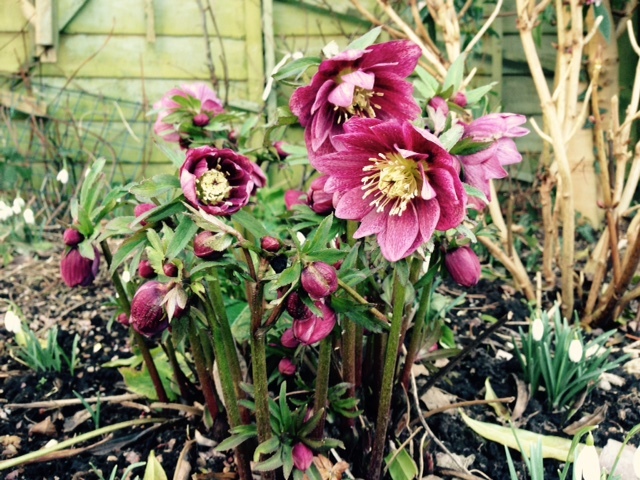 The hellebores too can lose their leaves at this time of year, all the better to see the emerging flowers and prevent the spread of hellebore leaf spot, which can debilitate the whole plant if you let it take hold. Affected leaves need to be put in the garden waste bin or burned, rather than composted, to prevent the spread of this fungal disease in future years. The species hellebores don’t seem to be afflicted, for some reason. I also cut down my English roses by half to prevent wind rock – although given the gales we’ve experienced recently, that’s probably shutting the stable door after the horse has bolted… Even my tall Daphne bholua Jacqueline Postill, source of the heavenly scent pervading the back garden at present, received a haircut. I usually trim its new top growth in late spring, after flowering, now it’s reached its desired height of 7 ft, but it has continued to grow in the warm, damp weather and was threatening to overpower its neighbours (and mine!). In the front garden, Daphne aureomarginata provides the fragrance that assails your nose the minute you step through the gate. It was planted as a small bush between the fence and apple ‘Katy’, but evidently loves its sheltered, if rather dry position, and has grown to a substantial bush some 6 feet across and 4 feet tall – I’m even thinking of trimming the lower branches of the apple to give it more room! Viburnum bodnantense Charles Lamont provides another shot of winter colour on the opposite side of the garden path. Unfortunately, it’s nowhere near as scented as the daphnes, nor even as other bodnantense varieties I’ve had in previous gardens, such as Dawn, but it’s a showy shrub nonetheless with lovely bronze young growth and pale pink clusters of blooms through the winter months. It was so good to actually get out in the garden at long last after weeks of constant wet or lack of time due to the hectic pace of work and a busy social life. I’ve still not finished the winter cutback; the grasses will need to be chopped back hard in February/March, but for now I’m still hoping for some proper winter weather to show them off in all their hoar-frosted glory. Happy New Year to you all! I, for one, am looking forward to the return of the gardening season. I love autumn, but it’s hard to predict what the weather is going to do from one day to the next! We’ve had a very mild spell recently down here in East Sussex, so the gardens are still full of late bloom and the autumn colours have been spectacular. Last weekend we managed to fit in a trip to nearby Sheffield Park (above), a National Trust property renowned for its fantastic foliage at this time of year and were rewarded with a fine sunny afternoon and plenty of photo opportunities. This weekend, it’s still unseasonably warm, but we’ve had so much rain, so no photo shoots today. Yesterday it poured all day long, just letting up in time for our annual village bonfire and fireworks – we didn’t need gloves or hats to watch the spectacle, but wellingtons were definitely in order to negotiate our way through inches of mud and slurry combined! 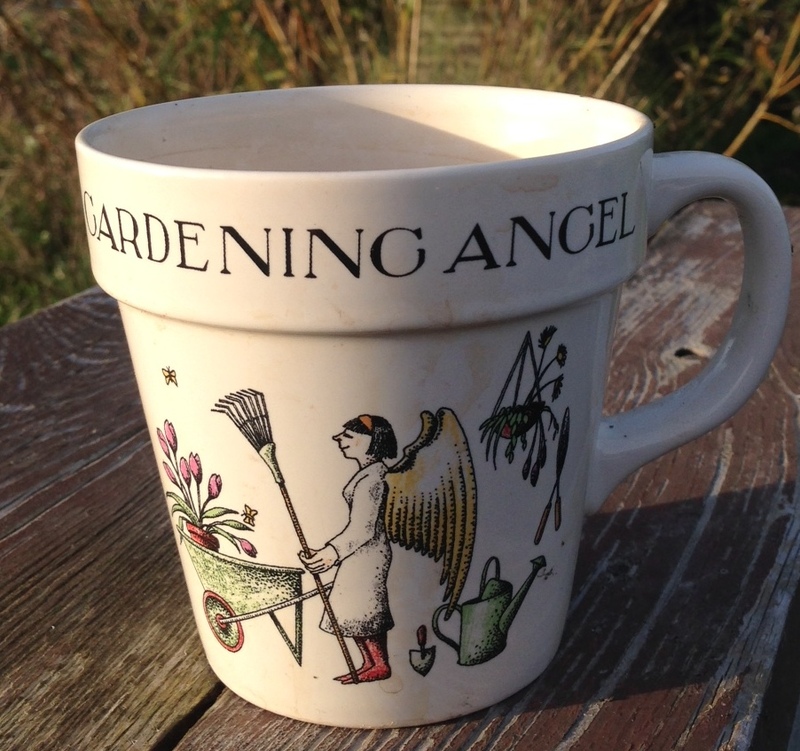 Pity the poor girl I saw tiptoeing through the quagmire in her Ugg boots…..
Today’s been a typical November day: dank and gloomy, but at least dry enough for me to venture out and finish planting up my winter pots. I started a few weeks ago, but the remainder were full of nasturtiums and fibrous begonias and still flowering merrily away. Tulips, too, don’t mind waiting until November to go in, so I wasn’t unduly worried, but I’m glad to have that job ticked off my list now. This year, I’ve gone for two doubles, Antraciet (dark red) and Chato (a deep magenta-pink paeony-flowered beauty), and singles Jan Reus (deep crimson), Request (a scented deep blood orange) and Atlantis (ivory with purple feathering), all ordered from Sarah Raven as usual. I’d kept my daffodil and crocus bulbs from last year, so just mixed them in too. Next year I really will have to order some new oak barrels, as my faithful bulb planters must be getting on for 20 years old now and are definitely showing signs of wear…. I finished the pots off with violet pansies, still going strong in the mild weather, and primroses divided from the garden. Should be a lovely show in spring! There’s very little time for gardening at this end of the year once the clocks have gone back, especially by the time I’ve fitted in two dog walks in the limited daylight hours. Still time, though, to nip down to the allotment and bring back handfuls of fresh rocket, coriander, parsley and dill, a perfect head of calabrese, some giant leeks and yet more windfall apples. The beans have all but finished, after a late start, but we really need a frost before I can make a start on the parsnips! Heat the oven to 160°C / Gas 4. Toast the pecans on a baking tray for 7 minutes, leave to cool, then chop roughly. Mix together the oats, chopped apricots, pecans, Rice Krispies, bran flakes and raisins in a large bowl. Warm the condensed milk and the maple syrup in a small pan and pour over the dry ingredients. Mix together well and turn into a baking tin measuring 30 cm x 20 cm x 5 cm, pressing down firmly. Cook in the pre-heated oven for 20-25 mins until golden. Leave to cool. Melt the chocolate separately in bowls over simmering water as usual (or use the microwave with great care, heating for minute-long burst each time!). Put spoonfuls of each molten chocolate dotted over the cake, alternating the white and dark chocolate. Make sure there are no gaps, then take a skewer and swirl the two chocolates together using a zigzag motion to create a marbled effect. Chill in the fridge until set, then cut into 16 bars. Scrumptious! * Note that proprietary corn flakes are not guaranteed wheat-free, so make sure you buy special gluten-free ones (and oats, for that matter) if baking for coeliacs. 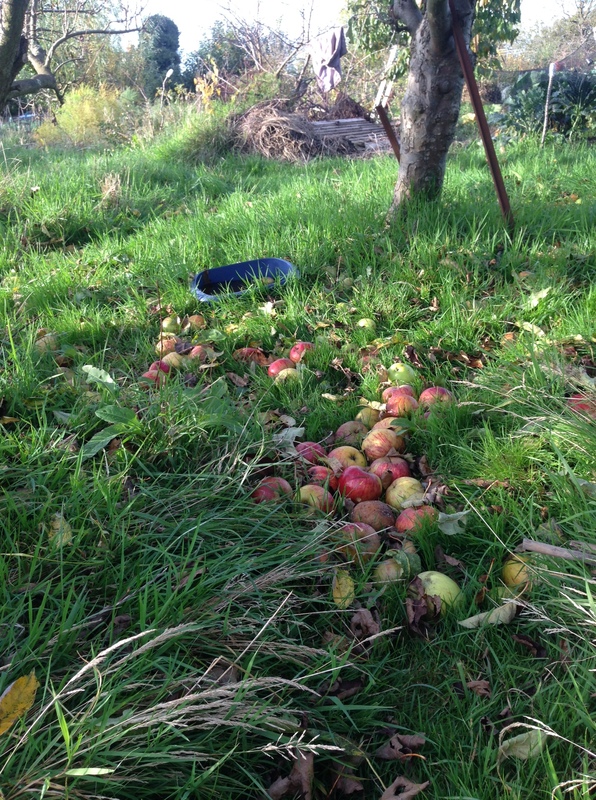 You know autumn is upon us with a vengeance when the apples start falling from the trees faster than you can pick them! 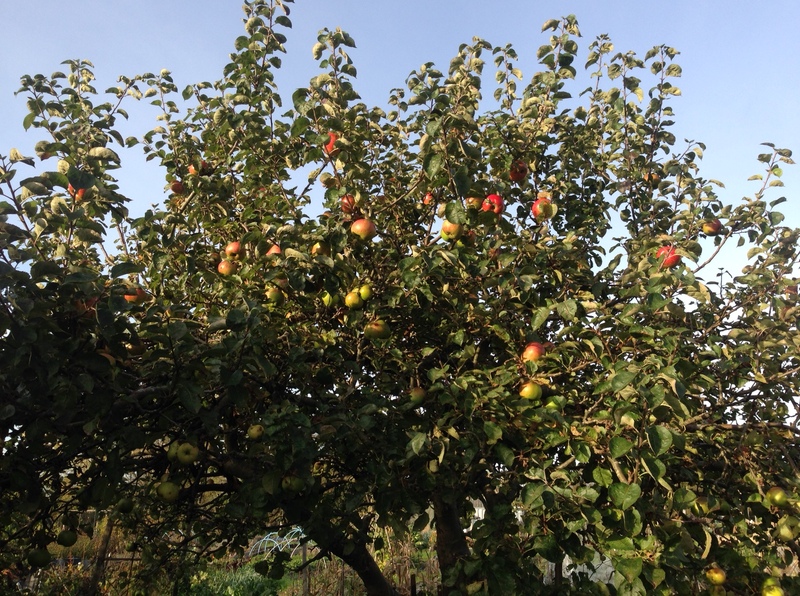 It’s been an excellent year for apples and the trees down at the allotment are laden. I seem to have been picking windfalls forever, but all of a sudden I realised I’d better start taking the good fruit off the tree as it’s all threatening to fall. As well as harvesting my apple bounty, I managed to sow my broad beans (Aquadulce) for next spring – always worth doing at this time of year – and cut down my sweetcorn and asparagus plants. 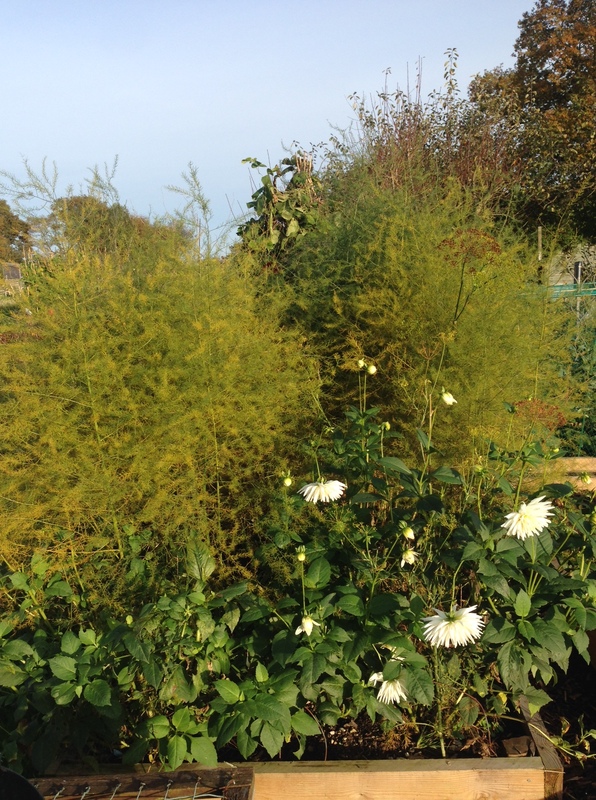 The asparagus had made their usual jungle of growth, but tend to get battered by the wind if you leave the spent foliage through the winter. Plus I had no problem with the pesky asparagus flies this year, having read that cutting the foliage down in autumn removes their overwintering habitat – which definitely worked! Tonight’s dessert is going to be that old stalwart, baked apples – one of my favourite easy puddings. So simple, yet so tasty. I barely need to give a recipe, as with my other apple ideas below; they really are more of a reminder of good combinations of ingredients majoring on apples, just in case you’re tearing your hair out, wondering what to do with them all! Wash the apple and gently pierce the skin all the way round the circumference of the apple with a sharp knife in one continuous line. This stops the apple exploding as it bakes. Core the apple using an apple corer, then place in a small square roasting tin and stuff the cavity with mincemeat. Sprinkle with the sugar and put a knob of butter on top. Add a couple of tbsp of water to the tin to make a sauce as it cooks, then cover the whole thing with foil and cook in a pre-heated oven at 200°C / Gas 6 for 45 mins to 1 hour. Serve with pouring cream. Make the apple purée and leave to cool. Toast the ground oatmeal under the grill or in a hot oven, turning frequently to brown on all sides – but watch it like a hawk as it can catch and burn very easily! Allow this to cool too. Whip the cream until soft peaks form, then fold in the yogurt, sugar and lemon juice, then stir in the oatmeal when cool. Spoon some apple purée into the bottom of a sundae dish and top with the oatmeal cream. Chill before serving – tastes even better if left overnight for the flavours to meld! Just toast the bread on one side under the grill as usual. In the meantime, grate the apple and cheese, add a dash of milk to bind, then stir in the walnuts. Spoon onto the untoasted side of the bread and grill again until melted and golden brown. 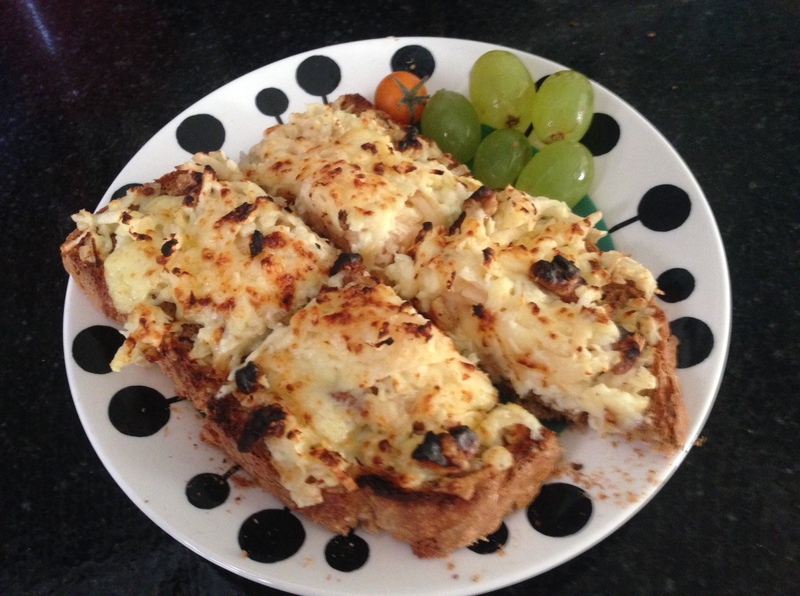 Take care that the walnuts don’t catch – best to try and submerge them under the cheese! My final suggestion is actually a recipe “proper”, this time from the National Trust magazine earlier this year. It’s an interesting variation on an apple cake and one I really enjoyed when making it back in September. I’d just returned from Normandy at the time, where I’d tasted delicious French cider, so I made a point of buying good French cider to make this – but I’m sure any would work! Pre-heat the oven to 160°C / Gas 4 and grease and base-line a large loaf tin. Rub the butter into the flour and stir in the salt, sugar, mixed spice, grated apple and the raisin and cider mixture. Then mix in the beaten eggs. Transfer to the tin and bake for about 1 hour until golden and cooked through when tested with a skewer. Boil together the glaze ingredients for 3-4 minutes and brush onto the warm loaf while still in the tin. Allow to cool, turn out, and serve buttered with a nice cup of tea. Mmmmm…. See also The Last of the Apples from Storage for yet more ideas of what to do with all those apples. Or check out the Ingredients Index for even more suggestions. And enjoy! You know what they say about an apple a day…. 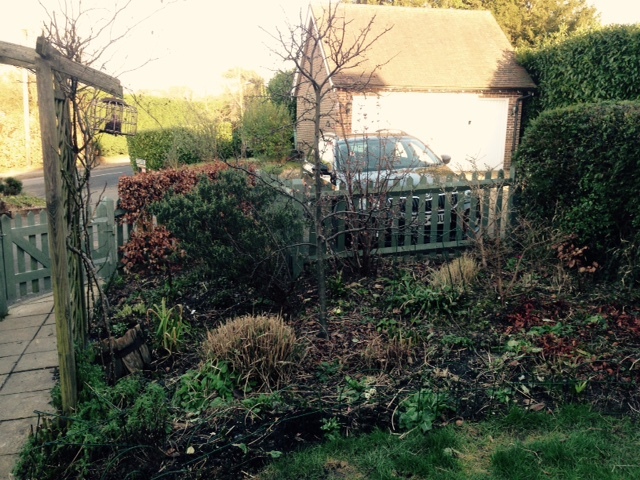 Despite the bitter wind and icy temperatures, I ventured out in the garden on Saturday afternoon to do battle with my perennial borders. The chilly Northern winds of the past week had wreaked havoc with my overwintering grasses: a statuesque Miscanthus zebrinus, burnished Miscanthus Sioux, the smaller, but no less fabulous Miscanthus yakushima and a stately Calamagrostis Karl Foerster. I love the way they stand tall through the worst of the winter weather and shimmer enticingly in the frost and snow (when we get any! ), but just lately I’ve noticed the dry stems have been torn asunder by the wind and are blowing round the garden. 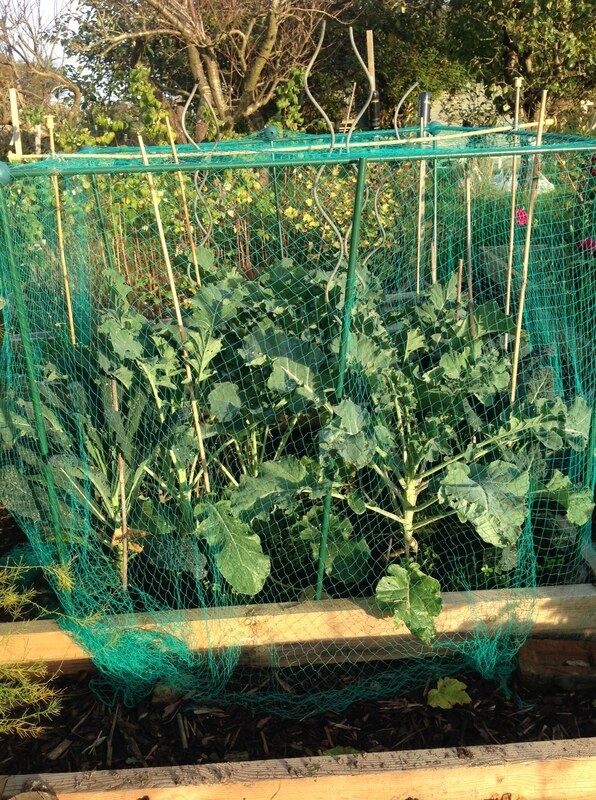 It’s also the ideal time to cut them back while it’s still so cold, before the new shoots start to form for this year’s growth. Helen Yemm, garden columnist for the Daily Telegraph and local gardening guru (a plotholder at our local allotments no less! 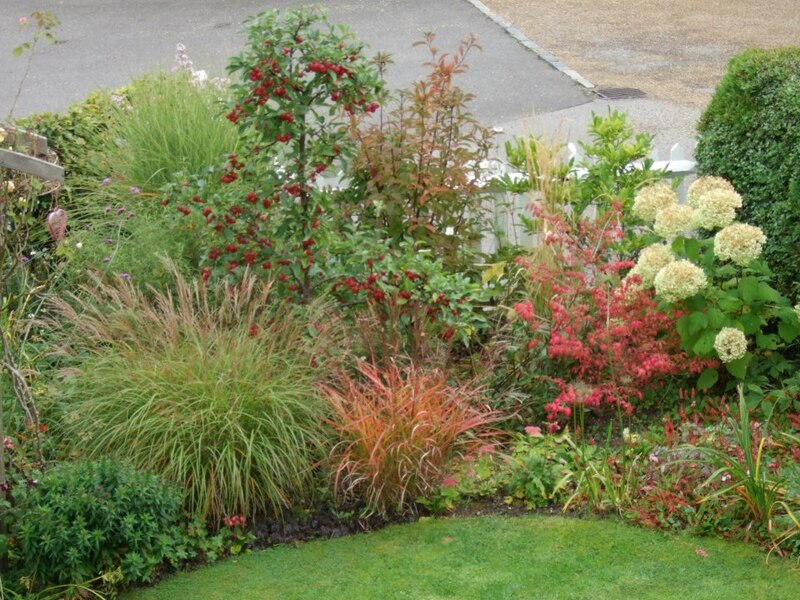 ), recommends tying up the grass before you start, to stop the stems blowing around as you work, but I find it easy enough to take handfuls at a time and snip about 6-9” from the base with my secateurs. I suppose with larger clumps and the tying-up method, you could go in with shears, or even a hedge-trimmer, but for my small garden, even with established clumps (the Miscanthus in particular are easily 2-3’ in diameter! ), I find the secateurs method quite manageable. The trick then is getting the wheelbarrow to the compost pile before the wind blows it all around the garden (or Poppy the dog buries her ball at the bottom of the barrow, then uproots the lot looking for it….). 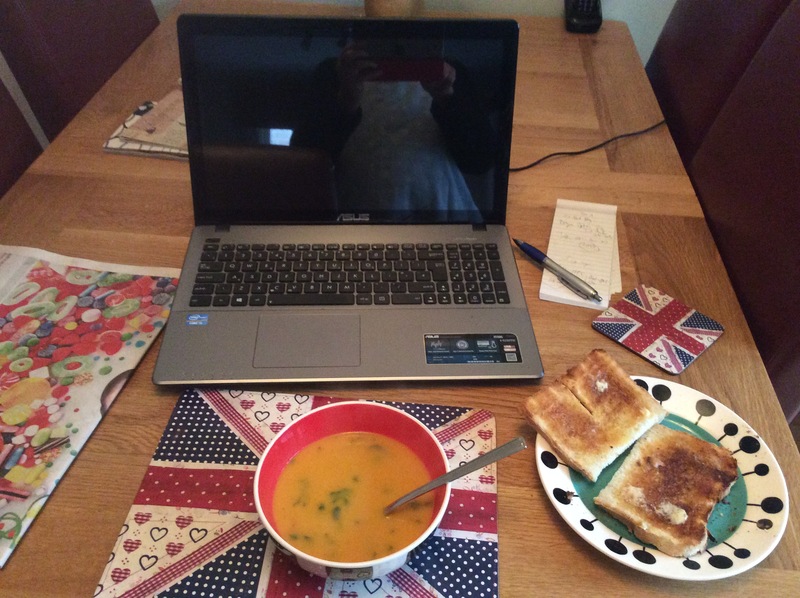 Definitely the kind of day for a bowl of homemade soup when you come back indoors, and one of my favourites is Carrot and Coriander, again originally based on my much-loved Covent Garden Soup recipe book, but adapted over the years. Not my own carrots, unfortunately – my heavy clay soil isn’t ideal for carrots, especially the main crop. I can usually manage summer pickings, enough for salads and steamed veg, but the slugs and carrot root fly (despite the fleece protection) go to town if I leave them in the ground too long. Melt the butter and gently cook onions, garlic and celery until soft – about 10 minutes. Meanwhile chop the carrots, then add with the crushed coriander seeds and cook for a further 5-10 minutes. Add the stock, nutmeg and seasoning, bring to the boil, cover and simmer for 20-30 mins or until the vegetables are tender. Leave to cool, then whizz in a blender until smooth. Return to a clean pan, stir in the chopped coriander (don’t add before you blend, or your beautiful orange soup will turn a murky brown colour…) and add milk (or cream if feeling luxurious!) depending on the consistency of the soup. I don’t like this soup too thin, but much depends on personal preference. Garnish with more coriander and a swirl of crème fraîche if you’re feeling posh! Otherwise enjoy as it is, served with fresh bread or sourdough toast. This should make enough for 6 generous helpings – and it freezes beautifully, of course. 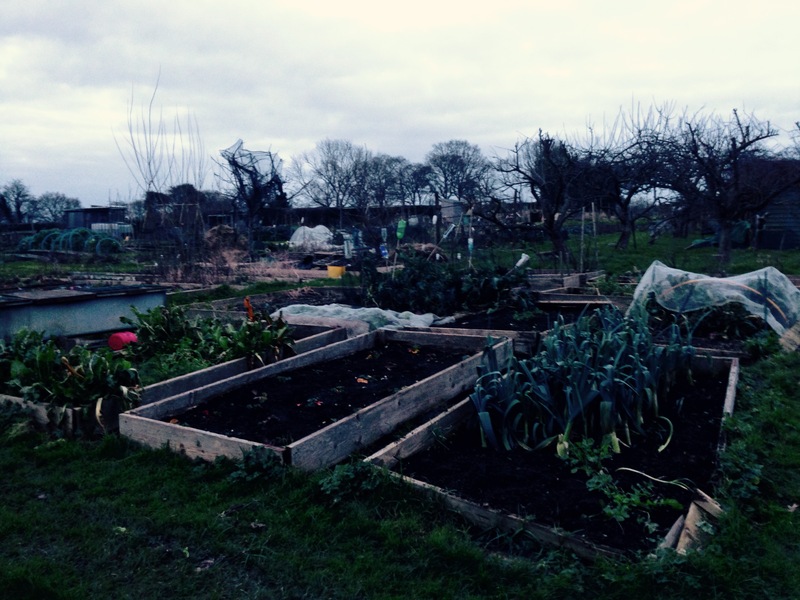 My first full weekend at home of the New Year and a lovely cold, yet sunny couple of days to boot – perfect for getting the allotment back in shape after a prolonged absence due to bad weather, pre-Christmas activities and a magical New Year trip to Austria. In the meantime, I spent a couple of hours finally getting round to a number of long overdue jobs: cutting down the spent asparagus stems – a job I should have done back in autumn in a bid to stop the dreaded asparagus beetle from overwintering, although it’s been pretty mild so far, so maybe a few sharp frosts between now and spring will still reap rewards; cutting down the dahlia foliage, another job I should have done in November, but it’s never done any harm leaving it in the past and my tubers are so huge now that they seem pretty resilient; taking down the runner/French bean tripods (I know, shameful to still have them standing in January and even more amazing that the wind hasn’t blown them down!) and general weeding – where does all that chickweed come from?! Two and a half hours of highly enjoyable pottering later, my plot looks radically improved, more or less weed-free (barring the paths, which need topping up with bark chippings) and ready to call in some help to reinstate the beds! Today’s haul was a creditable trug full of calabrese (so much better than last year, thanks to the Enviromesh which kept out the pigeons AND the caterpillars), leeks, parsley, rocket, Swiss chard, parsnips, swede and carrots. Not bad for a January day! There was plenty of calabrese for my stir-fried rice last night, as a vegetable accompaniment for tonight’s Shetland lamb chop in red wine & redcurrant sauce and for the majority to go in a delicious broccoli and stilton soup. I wasn’t sure about this recipe before I tried it, thinking the heavy dose of brassicas might make it sulphurous, but the combination of the broccoli (or calabrese) and blue Stilton is inspired. Delicious for lunch with crusty bread, or as a dinner party starter if you feel so inclined. Cook the onions in the olive oil and butter until soft – about 10 minutes. Add the chopped celery, leek, and potato and cook for a further 5 minutes. Pour in the stock and add the chopped broccoli. Bring to the boil, cover and allow to simmer for 20-25 minutes. Add the crumbled Stilton and parsley, stir for a couple of minutes, then season and allow to cool before blending in a liquidizer. Serve hot and enjoy the very distinctive and delicious taste! 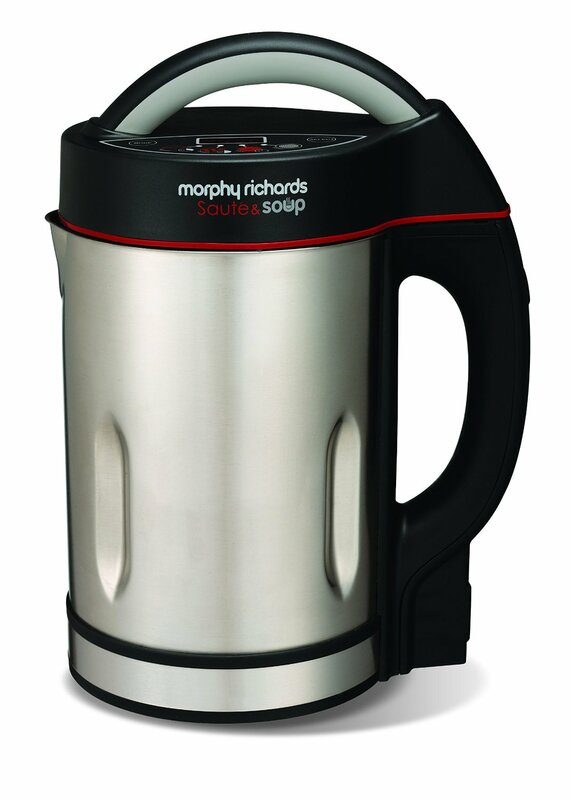 Having received an electric soup maker for Christmas (Morphy Richards Sauté and Soup), I thought I’d experiment with this recipe. I’ve made it before using the above method, but adapted it today for the soup maker as the liquid volume was the same as the recipes in the book supplied. On the whole it worked well, and should in theory cut down on washing-up and avoid the need to wait for the soup to cool before transferring to the liquidizer (often a messy operation!) as the entire process takes place in the soup maker. My problem was that the volume of vegetables meant that adding the stock would have brought the level to beyond the maximum marker, so I ended up just adding the broccoli stalks initially, then transferring the blended soup to a pan and adding the broccoli florets and Stilton, then returning most of the liquid and solid chunks to the soup maker and doing a final blend – which probably defeats the object…..! I’m undoubtedly far too set in my ways and used to making huge volumes of soup without thinking about restricting quantities – especially with my usual allotment-scale gluts of produce! 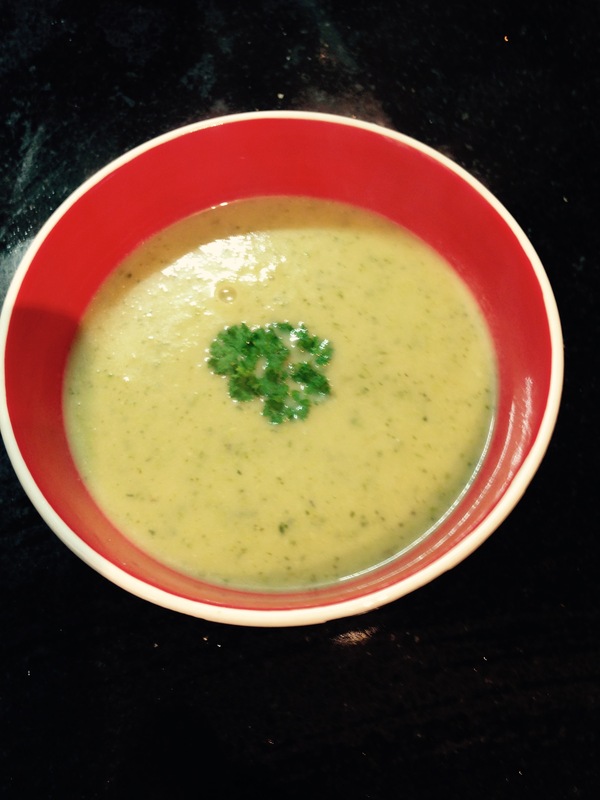 However, if you aren’t dealing with such large amounts and are prepared to stick fairly closely to the recipes, the resulting soup was certainly just as nice as when I’ve made it in the past using the old-fashioned method! If anything, I missed the alchemy of stirring, tasting and adjusting as I went; the fact that it’s all contained admittedly rules out any chance of the kitchen steaming up or the pan boiling over, but it also means you can’t adapt as you go. What was that about old dogs and new tricks…..? Anyway, Happy New Year and happy soup-making!